Opening reception on Monday November 1, 2010 from 7 – 9 pm. Entirely self taught Aliya began to develop her interest in art and painting with her fascination with Islamic Calligraphy, producing very intricate works in both Cursive and Kufic styles. She developed a unique style, incorporating her Calligraphy on Ceramics as well as hand-marbled fabrics and papers which she produced herself. 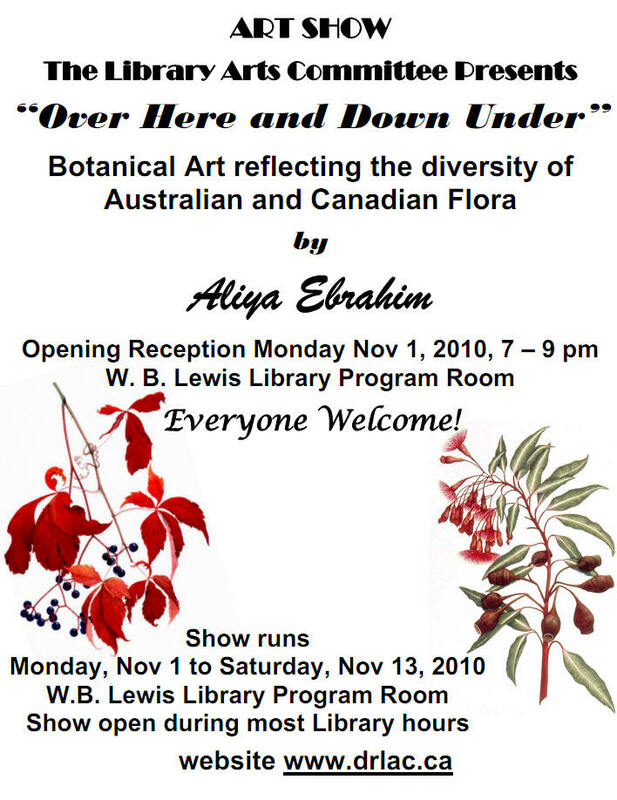 Aliya discovered watercolors and botanicals in 2002 and has worked in this field ever since. In 2002 and 2003 Aliya attended workshops by Pamela Stagg (Royal Horticultural Society Gold Medalist, 1991), who inspired her to develop her own strong and bold style that is greatly influenced by the flora and the colors of her native Australia. In her first show in Toronto, The Botanical Artists of Canada, Spring Orchid Show of 2002, her painting of a Lady Slipper Orchid received a First of Class, as well as Best of Show. Since then she has exhibited at the Annual Botanical Art Show, Canada Blooms (2002 – 2006), 7th Annual Show, Botanical Artists of America and the Horticultural Society of New York, New York, USA (2004), Botanical Art Show, John B Aird Gallery, Toronto, Canada (2005), 20 Driveway, Ottawa (2009), amongst others. She has been a member of Botanical Artists of Canada (BAC), Botanical Artists of America (ASBA) and Ontario Master Gardeners. Always a keen gardener Aliya is a qualified Master Gardener from Guelph University and a graduate of Albertus Magnus College in New Haven, Connecticut. Growing up in the Australian bush of the Southern Tablelands she has been fascinated with wildflowers since childhood. She has photographed, composed and illustrated hundreds of wild flower specimen in their natural Australian habitat during her annual family visits to Australia for the past ten years, and this has provided her with rich material for composition and painting. Living in Deep River with its large tracts of untamed forest in and around Deep River is a naturalist’s dream and has given Aliya a unique opportunity to follow her fascination with wildflowers and mushrooms of the area and allowed her to produce collections of Botanicals that thrive in similar habitats. The seasonal variations in Canada adds a different dimension to her works that makes for very exciting collections of Canadian flora for botanical compositions. Apart from working with watercolors Aliya has been experimenting with Gauche and Acrylics in her most recent works. Aliya’s works have been exhibited widely and her paintings are included in private collections in Canada, USA, England, Australia, Germany and Mexico. Her marbled fabrics and cards have sold in the National Gallery of Canada, Craft Council of Ontario and the Textile Museum in Toronto. Aliya lives and works in Deep River, and her works can be found at the “From the Valley Artisans Co-op” Gallery, in Deep River, Ontario, Canada.